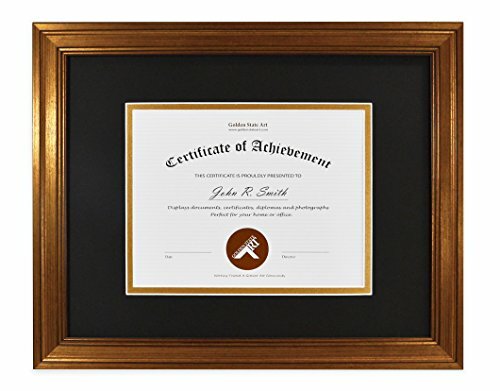 New Wall Frame for Certificate, Diploma, or Photo. Perfect for HOME or OFFICE, Photo Frames, and Picture Frames. It is a wonderful choice for a graduation or personal gift. Package includes only: 1x Frame with a Double mat & Real Glass. Frame Color is Dark Gold with very light pattern style. Double mat is Black over Gold with opening size 6.5x8.5 inches. Frame can fit 7x9 pictures or certificates (with mat) or a 11x14 photo (without the mat). Includes a White Core Double Mat (Black over Gold color). Opening size: 6.5 x 8.5 inches. Can Display Photo or Documents: 7x9 (with mat) or 11x14 (without mat). Frame Color is Dark Gold with very light patterns. Contains Real Glass.